May 2017 - Read. Think. Act. 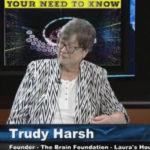 (May 23, 2017) Catherine Read talks with Trudy Harsh, founder of The Brain Foundation and Laura’s Houses. She formed this non-profit in 2003 to provide supported housing for those in our area living with brain diseases such as schizophrenia and bi-polar disorders. Laura’s House are named for Trudy’s daughter Laura who had a brain tumor removed when she was 8 years old and struggled with mental health issues up to the time of her death in 2006. 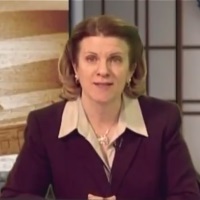 Trudy is a Realtor in Northern Virginia with over 40 years of experience. She is quick to acknowledge that she is not involved in direct services for mental illness, but she does know real estate. Her mission is to provide safe and affordable housing for those who are capable of living more independently in a small group setting. She keeps this population in Fairfax County from becoming homeless by providing housing based on their ability to pay. The first house she purchased was in Fairfax City and it was made possible by an infusion of $50,000 from another Realtor who believed in her mission. There are now 9 Laura’s Houses. She purchases 4 bedroom homes so there are four residents in each home. They are in integrated within the larger community in a way allows them to be part of a neighborhood. Trudy expects that they will be self sufficient in 10 to 15 years. The Brain Foundation has partnered with Pathways and the Community Services Board (where Trudy served for two terms) to find potential residents who are likely to thrive in this environment. Not every placement works out and Trudy monitors the residents in each home and makes adjustments as necessary. The long term consideration for this founder is about succession planning, maintaining and adding supporters, and recruiting new board members to keep the work of The Brain Foundation viable over the next decades beyond her stewardship. 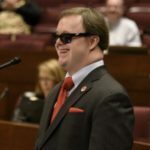 This organization has been successful in showing that supported housing can make the difference in the lives of those living with brain disease. They need an infusion of new interest, younger supporters, and of course . . . money. On June 3, 2017, The Brain Foundation will host it’s annual fundraiser and this year’s keynote speaker is Virginia Senator Creigh Deeds. It will be held at Maggiano’s at Tyson’s Galleria and the public is invited. If you can’t attend, consider making a donation to this very worthy organization. 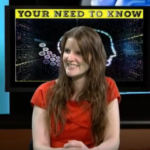 (May 2017) Catherine Read talks with Lucy Beadnell, Director of Advocacy for The ARC of Northern Virginia, about the programs and services they provide to people in our community with Intellectual and Developmental Disabilities. The ARC is celebrating 55 years of supporting the IDD community in our region and continues to add programs, services and staff to their robust suite of resources. Lucy talks about the ARC’s public speaking program “A Life Like Yours Toastmaster’s” which is an adapted Toastmaster’s model pioneered by People First. The drop-in group includes both people in the IDD community and their allies. In a recent Fairfax County Budget Hearing, Elizabeth Carter and Frank Stephens spoke to the Fairfax County Board of Supervisors on behalf of preserving resources for human services agencies like the ARC. These two young people wow’d the crowd with their great public speaking skills and their ability to so clearly advocate on behalf of themselves, their community and the organizations that support them. Some of the exciting new initiatives involve app based technology. The Arc of Northern Virginia has partnered with SpecialNeedsWare, Inc to develop a travel training curriculum called TravelMate, which helps people to more confidently use public transit. Kymberly Deloatche, Travel Training Coordinator for the ARC, works with teachers, job coaches, therapists, assistive technology specialists, disability providers and family members on how to use this new technology. Newly added to their suite of tech tools is EmployMate which uses a similar model to help people navigate their employment tasks by acting as a guide, memory tool and resource. In the ARC’s Special Needs Trust Department, Lucy talks about the work of Megan Rusciano, Beneficiary Advocate and the many services she provides to families from case management to life planning and many thing in between. It’s a needed support for families looking toward the long term well being of their family members. It’s no surprise that The Northern Virginia Chamber of Commerce selected Lucy Beadnell as a nominee for the 2017 Outstanding Corporate Citizenship Awards in the Emerging Leader Category. The Corporate Citizenship Awards honor individuals, businesses and non-profits for above-and-beyond business leadership and corporate social responsibility. Lucy’s work, and that of the entire ARC of Northern Virginia staff and their Board of Directors, continues to be a model for effective direct services and advocacy. Under the leadership of their Executive Director, Rikki Epstein, they are relentless champions for integrating those in the IDD community into every local community where they live in Northern Virginia. (May 2017) Catherine Read talks with Rev. James Atwood, author of the book Gundamentalism: And Where It Is Taking America, and a member of the Board of Directors of The Coalition to Stop Gun Violence. Catherine is joined in the second half of this show by Andy Goddard, Legislative Director for The Virginia Center for Public Safety. In the first segments, Rev. Atwood talks about his experience as a gun owner, including his experience taking a gun to Japan in 1968 and the restrictions in place at that time on gun ownership in that country. His moment of reckoning in getting involved in gun violence prevention was when a charter member of his church was shot and killed by a teenager as part of a botched robbery. He has now written two books on the subject, the first one published in 2012, America and Its Guns: A Theological Expose. He is now a retired Presbyterian pastor and remains committed to his work on gun violence prevention in the United States and in Virginia specifically. 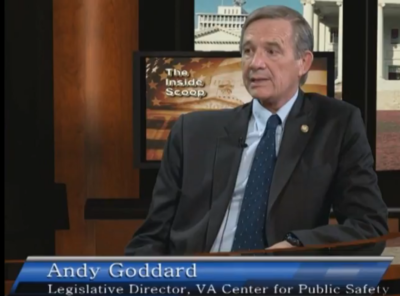 Andy Goddard, father of Virginia Tech shooting victim Colin Goddard, has been actively involved in gun violence prevention in the decade following the mass shooting in 2007. In his work for The Virginia Center for Public Safety, he is focused on gun legislation specific to the Commonwealth of Virginia. Out of the thousands of bills filed each legislative session, there are many related to guns. In 2017, there were bills related to concealed carry permits, guns in schools, domestic violence and child access. Mr. Goddard tracks those bills, helps to organize testimony for committee hearings around specific bills, and keeps the public informed. Details on the 2017 gun bills can be found at The Virginia Center for Public Safety. There are numerous organizations working on the issue of gun violence prevention here in Virginia. Moms Demand Action for Gun Sense in America, Everytown for Gun Safety and The Coalition to Stop Gun Violence are some of those groups active in our area. They help to organize constituents around defeating bad legislation in Virginia every legislative session. Here in Fairfax, VA, on the 14th of every month, there is a gathering of activists outside the NRA headquarters to mark the shooting at the Sandy Hook School in Connecticut on December 14, 2012, that took the lives of 20 children and 6 adults. With an estimated 350 million guns already in the United States, most of them unregistered, we need to move the conversation from the right to own guns – which is not in dispute – to how to regulate them in a way that reduces the 32,000 gun deaths in our country every year. 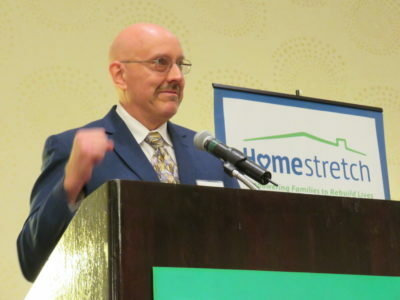 (May 1, 2017) Catherine Read speaks with Homestretch Executive Director Christopher Fay. This non-profit provides transitional housing for families with children in Fairfax County. Founded in 1990, they have 50 homes distributed throughout the county and they support families for two years with safe housing and additional support services. They offer assistance in helping families to pay down debt, repair their credit history, pursue additional education and certifications, and to find jobs with a career path. They also offer English as a second language classes. Over 50% of the Homestretch families are women with children who are victims of domestic violence. Some have been victims of human trafficking, and some are refugees from countries where the U.S. has had a military presence – Afghanistan, Iraq and the Sudan. Some families are there because of the death of a loved one, a medical crisis or prolonged unemployment. Everyone there has children, and all have suffered some type of trauma in their lives. The shocking reality about homelessness in the United States is that the average age of a homeless person is 9 years old. Sixty percent of the homeless population in this country are families. Homestretch clients come from area shelters where they have been given temporary shelter. Support services include Kidstretch, which serves the children of Homestretch and is also open to the public. They partner with Fairfax County Early Literacy Services and provide access to cultural enrichment activities, structured play and field trips. Teenstretch supports middle school and high school students in Homestretch with programs focused on Social/Emotional Development, Academic Support, Healthy Living, Life Skills and Community Service. Christopher Fay shared stories of some of the families who have come to Homestretch under the most dire of circumstances. Because they support families longer than most taxpayer programs provide for, Homestretch raises 95% of their operating funds themselves. In addition to their many fundraising activities, they have long term corporate partnerships with area companies like Excella Consulting, Integrity Management Consulting, Butz Wilbern, The JBG Companies, Mayer-Brown, ReedSmith LLP and many others. Beyond monetary and in-kind donations, these companies have employees who are actively engaged in providing support and services directly to Homestretch families.Faith communities like Dulin United Methodist Church also provide support and volunteers. In addition to a staff of 20, there are 300 to 400 volunteers providing everything from mentoring adults and providing meals to dental services and moving services. Homestretch is unique in following up with their families to determine how successfully they have maintained self-sufficiency years after leaving the program. George Mason did one such study and George Washington University did two. Those results showed 95% of their program participants were still living independently and are successfully integrated into their communities. There are many ways to support Homestretch. Cash donations are gratefully accepted, donations of furniture and furnishings for new families (families take their furniture with them when they move on), painting and landscaping, providing meals and snacks for classes and providing transportation to classes in Falls Church for Homestretch families. Often there are collection drives for things like welcome baskets, mattresses, Easter baskets, diapers, etc.